The Milwaukee Brewers have announced the hiring of Carlos Subero as first base/infield coach and Jason Lane as coach. The announcement was made by General Manager David Stearns at Major League Baseball’s annual Winter Meetings in Nashville, TN. The now completed 2016 coaching staff includes Subero, Lane, Darnell Coles (hitting coach), Derek Johnson (pitching coach), Pat Murphy (bench coach), Ed Sedar (third base coach) and Lee Tunnell (bullpen coach). All but Coles, Sedar and Tunnell are new to the staff. 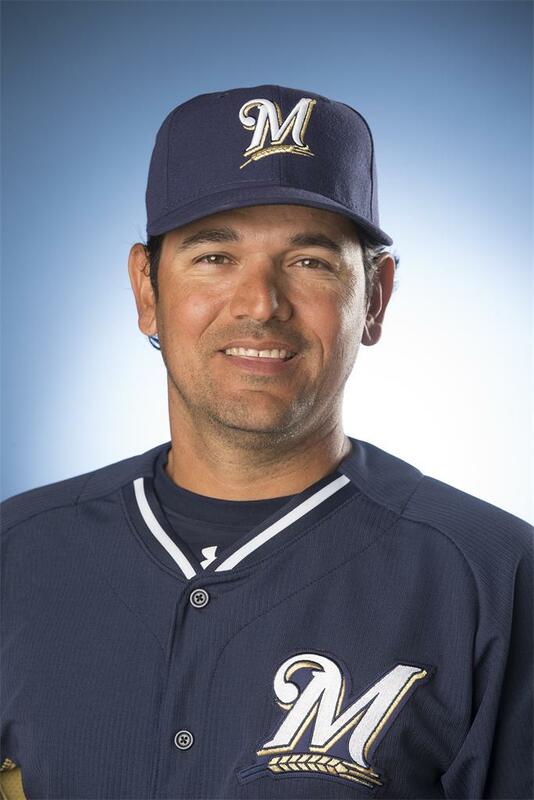 Subero, 43, joins the Major League coaching staff after spending the last two seasons as manager at the Double-A level in the Brewers organization. He guided the Biloxi Shuckers to a Southern League Championship Series appearance in 2015, a season after leading the Huntsville Stars to a postseason berth. The Shuckers were named 2015 Minor League Team of the Year by Baseball America. Prior to joining the Brewers, Subero managed five seasons in the Dodgers organization at Class-A Inland Empire (2009), Double-A Chattanooga (2010-12) and Class-A Rancho Cucamonga (2013). He also managed in the White Sox organization at Double-A Birmingham in 2008. Subero began his coaching career in the Rangers organization, which included two seasons as hitting coach with the Rookie Gulf Coast League Rangers (1999-2000) and seven as manager with the GCL Rangers (2001-02), Class-A Clinton (2003-05) and Class-A Bakersfield (2006-07). He owns a career managerial record of 949-973 (.494), including 78-59 (.569) at Biloxi this past season. A former middle infielder, Subero played six seasons in the minor leagues for Kansas City (1991-94), Pittsburgh (1995) and Texas (1996). 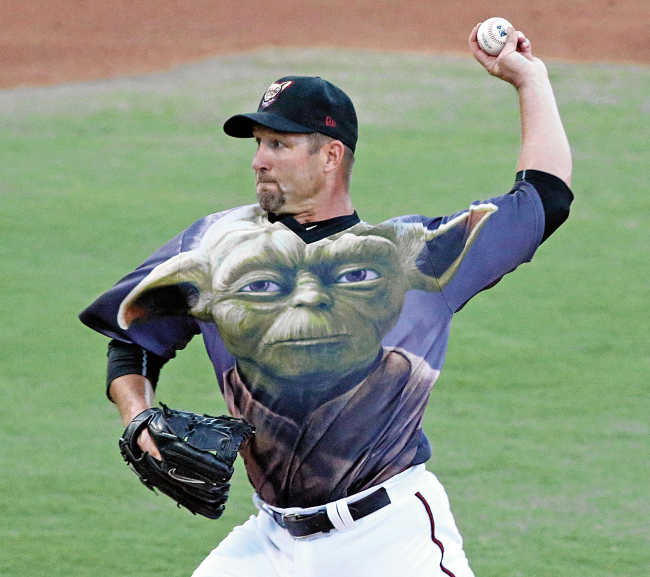 Because if you can use a photo of Jason Lane in a Yoda jersey, do it you must. Lane, who turns 39 on December 22, completed 17-year professional playing career in 2015, including seven seasons in the Major Leagues with Houston (2002-07) and San Diego (2007, 2014). The former outfielder was converted into a pitcher in 2012 and made his only Major League pitching appearances with the Padres in 2014, going 0-1 with a 0.87 ERA in three games, including one start (10.1ip, 7h, 1r, 1er, 0bb, 6k). He spent the 2015 season at Triple-A El Paso (San Diego) and went 10-10 with a 5.71 ERA in 28 starts. and 78 RBI in 145 games for the National League champion Astros. Because I want to be able to find these quickly later (and so that I can easily share them with those of you who may have missed them earlier), I’ve decided to link all my tweets from Thursday’s end of season press conference with new Brewers GM David Stearns and Field Manager Craig Counsell. There were more points that I couldn’t completely type up on the fly (like having a plan in place for the off-season before arriving at the GM Meetings in November) that warrant mention, but this is just my tweet log. Counsell said 1st big step in admitting that they need to do things differently in order to have consistent success was trading Gomez/Fiers. Stearns was asked about his front office. He said as it’s difficult to meet with people during the season, he’s only really at Day 4. Stearns: “Thereare pieces here around which to build.” Spoke of depth of young starting pitcher, strength up the middle and corner OF. Stearns wasn’t certain how he is going to fill 3B for next year at this point. Considering a platoon. Will consider external options. Stearns spoke about Braun’s love for the community/team/fans. Said that he wants to experience winning here again. Said on same page there. Here’s the final thing I tweeted, and I think it’s the takeaway for any fan who is worried about a rebuild taking seven years. Stearns said you don’t necessarily need to wait for drafts to bear fruit before contending, but need strong drafts to power sustainability. After Ron Roenicke was relieved of his managerial duties late Sunday evening by the Milwaukee Brewers — and once the requisite hot takes about whether the firing was the right move died down — chatter sparked up about who would replace the man who has been at the helm of this club since taking over prior to the 2011 season. Rosenthal wasn’t the first person to suggest that Counsell could be the choice. Speculation was running rampant on social media as everyone tried to determine who made the most sense. Names like Ron Gardenhire and even *shudder* Dusty Baker were offered as out-of-work managerial types who weren’t all that busy over the weekend. In the end, Counsell got the nod. General Manager Doug Melvin told reporters last night that the decision to relieve Roenicke and go in another direction was made following the series loss in Cincinnati during the just completed road trip. It then took a couple of days to ask and subsequently negotiate a deal. Roenicke nor his coaches were informed of the decision until Sunday evening and while the rest of the coaching staff is being retained for the rest of the season (for now anyway), Roenicke’s firing could signal the beginning of much bigger changes on the horizon. Counsell is another in a recent trend of hirings at the Major League level of former players who lack managerial experience. Mike Matheny has had the most success in St. Louis to this point but Brad Ausmus in Detroit and Robin Ventura with the White Sox, Walt Weiss in Colorado, Matt Williams with Washington. There are only 30 of these jobs, after all. Counsell has signed a three-year contract to manager the Brewers. The Milwaukee Brewers have named Craig Counsell the 19th manager in franchise history, signing him to a three-year contract through the 2017 season. Counsell replaces Ron Roenicke, who was relieved of his duties last night. The announcement was made by President – Baseball Operations and General Manager Doug Melvin. 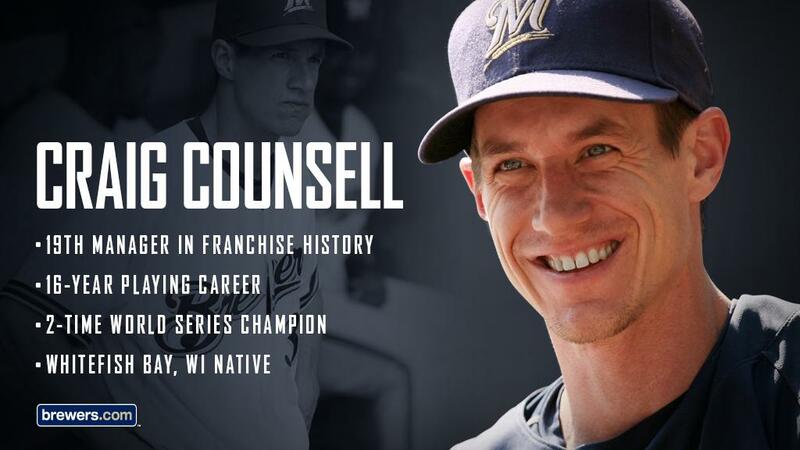 Counsell, 44, joined the front office on January 17, 2012 as special assistant to the general manager. The former infielder enjoyed a 16-year Major League playing career, batting .255 with 42 HR, 390 RBI and 103 stolen bases in 1,624 games with Colorado (1995, ‘97), Florida (1997-99), Los Angeles (1999), Arizona (2000-03, 2005-06) and Milwaukee (2004, 2007-11). He was a member of World Series championship teams with Florida (1997) and Arizona (2001), and was named Most Valuable Player of the 2001 National League Championship Series. Counsell, a 1988 graduate of Whitefish Bay High School and 1992 graduate of the University of Notre Dame, resides in Whitefish Bay with his wife, Michelle, their sons, Brady and Jack, and daughters, Finley and Rowan. His father, John, worked in the Brewers front office as director of the speakers bureau (1979-85) and director of community relations (1986-87).